From its humble beginnings as a small fishing village to becoming the first dockyard in the country, Greenock is a testament to Scotland’s maritime accomplishments, as well as being an incredibly picturesque place to live. Greenock’s association with Scottish achievement doesn’t stop there either-it is also the birthplace of James Watt and is famous for founding the first ever Robert Burns Club. Here at Hog Roast Greenock we love being involved in celebrating the town’s history and achievements with the fantastic fresh food we can provide for any kind of event. We can also give our diners the freedom to host their special occasions in settings that make the most of the spectacular coastal views, due to our ability to cook in any location, whether it be by the marina or on the clifftops above it overlooking the iconic anchor-shaped war memorial for French sailors. With Hog Roast Greenock at the helm for your big day, you won’t have to choose between great food or a great view. Thanks to our state of the art hog roasting equipment that can be transported and used anywhere and our talented Chefs who can cook to a consistently high standard in any location, you can have the best of both worlds. You won’t find yourself with limited menu options either- we have an extensive range of freshly-prepared menus to suit all palettes. We specialise in our superior hog roasts of course, but we can also offer a range of other meats, as well as vegetarian dishes, formal 3-course meals and canapes, all prepared at your venue in front of your guests using the very best locally-sourced ingredients. All of our menus can be adapted to suit your requirements and can be served in a buffet style or as a formal sit-down meal with full table service by our own experienced waiting team. 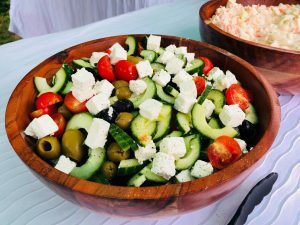 Our friendly and talented team put our heart and soul into every event we cater for whether it be a wedding, christening, graduation party or company conference. Not only are we Greenock’s number one choice for hog roasts, we have also established an excellent reputation in the local area for being a highly versatile catering company who can offer you modern, polished menus in the setting of your choice.